For Spring Break we leveraged a trip to South Florida to watch the Nationals play the Marlins in their new stadium: Marlins Park. The stadium is quite impressive: from the retractable roof; the Clevelander swimming area; the field, itself; and the food. In fact, the food choices rock: Ceviche, lobster rolls, mahi-mahi tacos, cuban sandwiches, giant hotdogs -> just make sure you head to the Taste of Miami section. The downside, poor beer selections. They only craft brew I found was Sam Adams from Boston Beer Company. I've heard from other sources that Dogfish Head Craft Brewery 60 Minute IPA is available, but from circumventing the stadium - only massed produced beer was on the horizon. Tough. 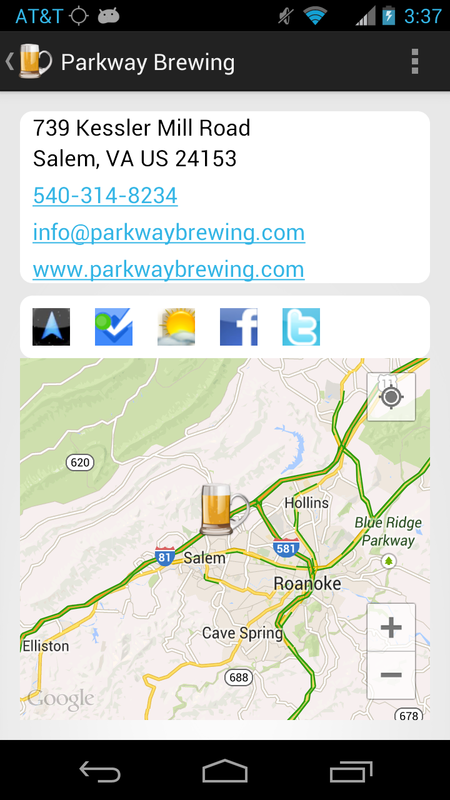 I've been finding several beers from southwestern Virginia's Parkway Brewing making its way into the DC market. 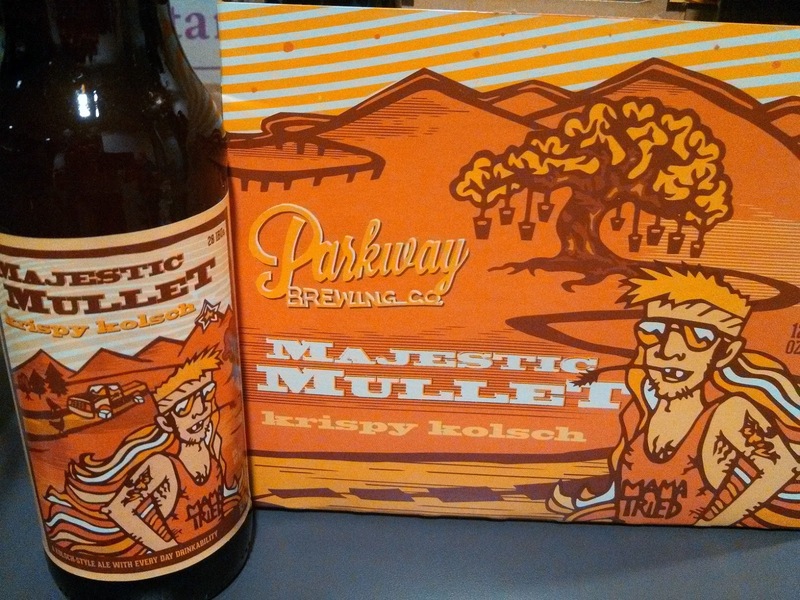 One of these is the Majestic Mullet Krispy Kolsch which I first purchased solely because of the packaging and brand name. Good marketing. However, I now have another summer after-biking beer with this refreshing slightly hoppy and yeasty brew. Looking forward to navigating my way to the brewery using theCompass during Floydfest. Cheers. 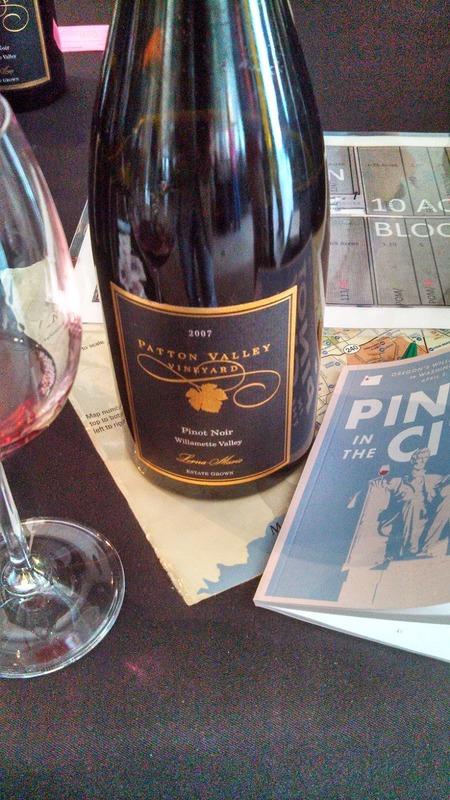 On April 2nd, the Willamette Valley Wineries Association hosted 54 Willamette Valley winemakers in Washington DC for Pinot in the City. 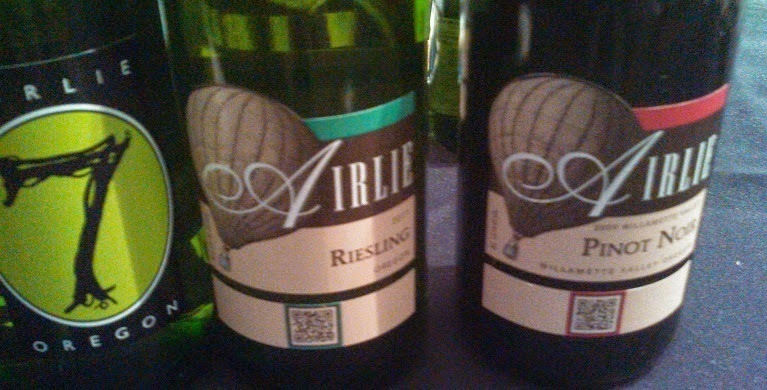 All the wineries poured the region's signature Pinot Noir but there was also samples of Pinot Gris, Pinot Blanc, Chardonnay, Riesling, as well as a few other varieties. Due to time restraints, it was impossible to sample from all the participants, but here's a rundown of what I learned. The Willamette Valley is a large AVA and includes six sub-appellations: Chehalem Mountains, Dundee Hills, Eola-Amity Hills, McMinnville, Ribbon Ridge and Yamhill-Carlton. The first two sub AVAs are probably the most unique. The Chehalem Mountains consists of three distinct areas within the AVA that differ in soil composition. The northwest section faces the ocean and contains sandstone and marine sediment, whereas the southeastern section is derived from volcanic activity. The northeast side contains soil deposited from the prevailing winds created silty, loess soils. The Dundee Hills is primarily volcanic soils at the top of ridges with the loess soils at the bottom. Pinot Noir came to the Valley in 1965 when David Lett of Eyrie Vineyards first planted Pinot Noir and other cool-climate varieties (he was the first to plant Pinot Gris in all of America). Soon others such as Adelsheim Vineyard, Erath Vineyards, Ponzi Vineyards, Elk Cove Vineyards, and Sokol Blosser Vineyards. Today there are 378 wineries operating in the valley with many able to transition to second generation winemakers or vineyard managers - some who were in attendance for Pinot in the City: Jason Lett of Eyrie Vineyards, Luisa & Maria Ponzi of Ponzi Vineyards; Morgan Broadley of Broadley Vineyards; Adam Campbell of Elk Cove Vineyards; Alex Sokol Blosser of Sokol Blosser Vineyards; and Peter Shea of Shea Wine Cellars. I started the tasting with Patton Valley Vineyards as they had empty space when I arrived. Winemaker Derek Einberger walked me through the estate's terrior and the three excellent estate and block specific Pinot Noirs. Pretty fascinating that the 10 Acre and West Block lots are close in proximity but produce very different wines. Close by Lynn Penner-Ash (Penner-Ash Wine Cellars) was pouring a very nice estate driven Dussin Vineyard PN as well as a very floral Viognier. I got my first taste of Pint Gris from Ponzi Vineyards and R. Stuart & Company - both great values at $17 plus more excellent PN, including the 2010 40th Anniversary reserve from Ponzi. On the first floor, I also visited with Sokol Blosser Vineyards, Shea Wine Cellars, and Seven of Hearts Wine. Moving upstairs I met Tom Fitzpatrick of Alloro Vineyard who I would spend the following day with at A Lunch Date with Alloro Vineyard for #PinotInTheCity. Nearby were two Willamette Valley pioneers David Adelsheim of Adelsheim Vineyard and Mary Olson of Airlie Winery. I really enjoyed the latter's White Blend and Riesling and the former poured a nice Chardonnay and Elizabeth's Reserve PN. I spent a considerable amount of time talking to Clare Carver of Big Table Farm who along with her husband Brian, operate a complete farm ecosystem within their property. We are talking poultry, pigs, cows, egg-laying chickens,a large garden, and honey bees. Clare gave me excellent advice for the bees whenever I finally get motivated to introduce a hive into my backyard. Their wines, excellent from the 2012 Chardonnay to the 2012 Willamette Valley PN and 2012 Eola-Amity Hills Pelos Sandberg Vineyard PN - smooth and silky. Clare also drew they awesome artwork on their labels. Moving on I enjoyed talking and tasting with Scott Neal, owner and winemaker at Coeur de Terre Vineyard (Pinot Gris); Morgan Broadley of Broadley Vineyards (two very nice Zenith and Shea vineyard specific PN); Craig Camp of Cornerstone Oregon (2011 Stepping Stone PN); Thomas Gerrie of Cristom Vineyards (2010 Sommers Reserve PN melts in the mouth); Natalie Sigafoos of Dusky Goose (their 2010 Rambouillet Vineyard PN - Dundde Hills - quite good); Adam Campbell of Elk Cove Vineyards (2010 Mt. Richmond PN and Pinot Gris); and finished the day with Jason Lett of Eyrie Vineyards who was pouring a very nice Pinot Blanc as well as one of my favorite Pinot Gris of the day. Needless to say, but what an amazing tasting. Every Pinot Noir was unique and enjoyable. 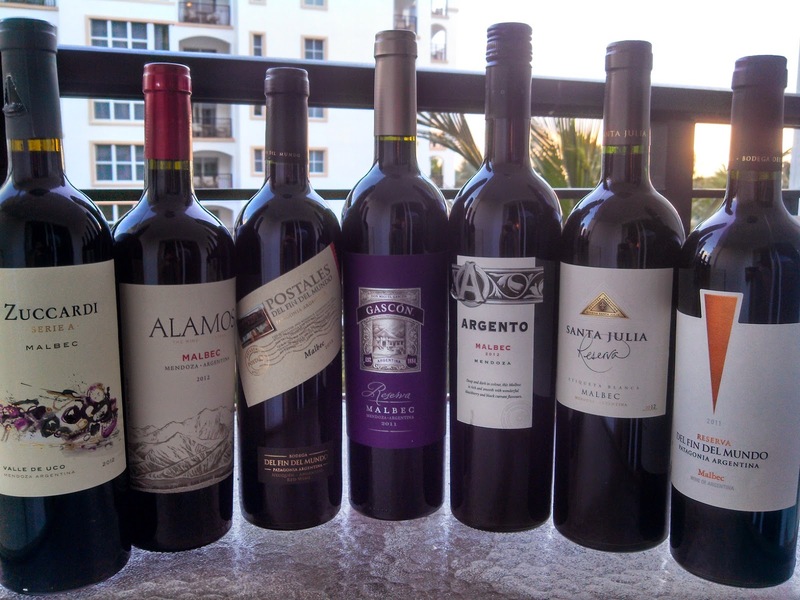 The Willamette Valley is a region where you can depend on its quality and at times, affordable prices. Let's hope for a visit to the area very soon. Cheers. Georgia has a burgeoning wine culture with most of the wineries situated northeast of Atlanta. 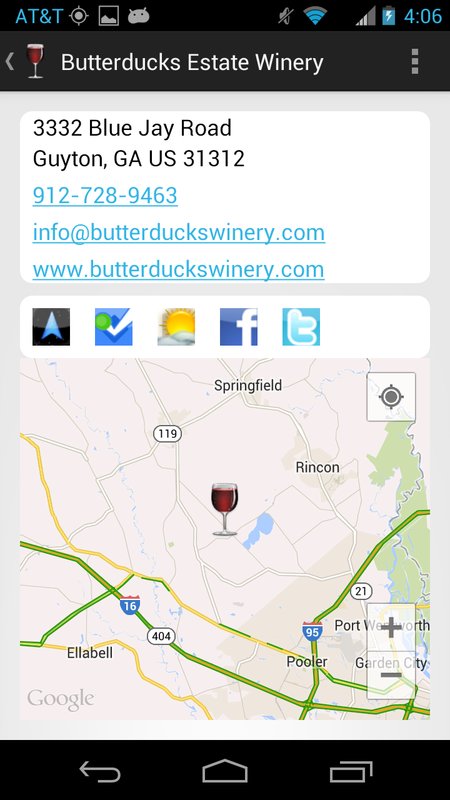 One exception is Butterducks Estate Winery ($17), located in the northeast corner west of Savannah. See theCompass profile on the right.The winery just celebrated their 8th anniversary and based on their location and wine list, I would guess that they grow muscadine grapes and perhaps blueberries and blackberries. They also produce a selection of Georgia vinifera with one of these being a Viognier. 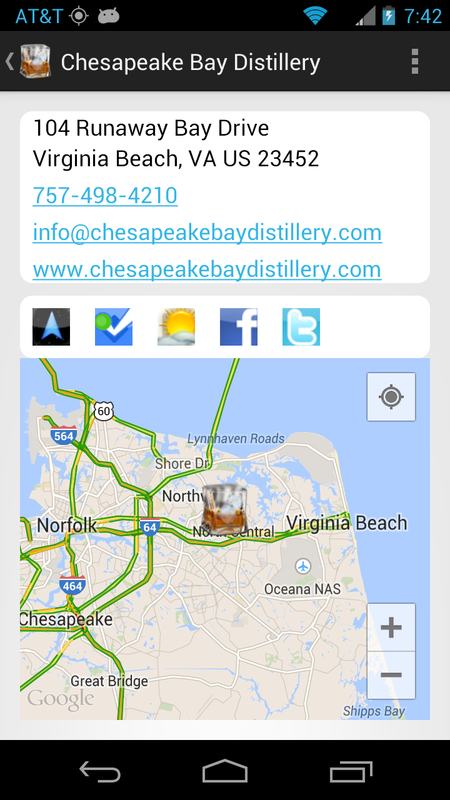 I was able to procure a bottle at Coastal Spirits - in Peeler - just a mile of Rt 95. 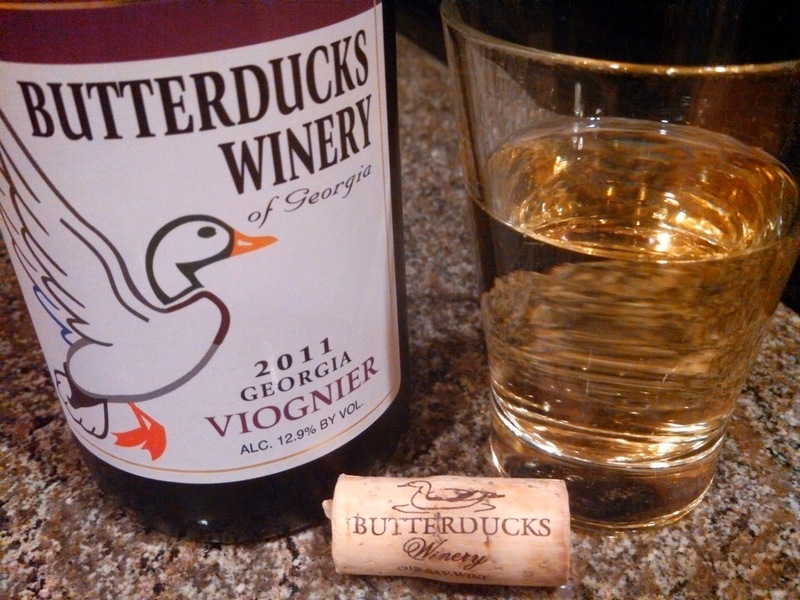 The Viognier grapes were sourced from Blackstock Vineyards in Dahlonega. The wine has a sweet honey-sickle aroma; the flavor, creamy with hints of apricot and finishes with decent acidity and some sugar. Seems very close to a Viognier profile and I found it very likeable. The one issue is the slight sugary finish at 2.5% R.S.. Otherwise a very nice wine. Cheers. 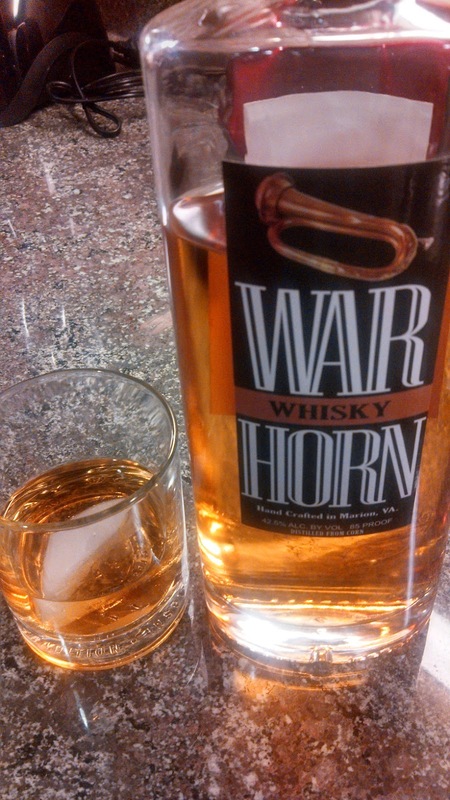 Staying with the local theme, I picked up a bottle of Virginia Sweetwater Distillery (Appalachian Mountain Spirits) War Horn Whiskey ($34). 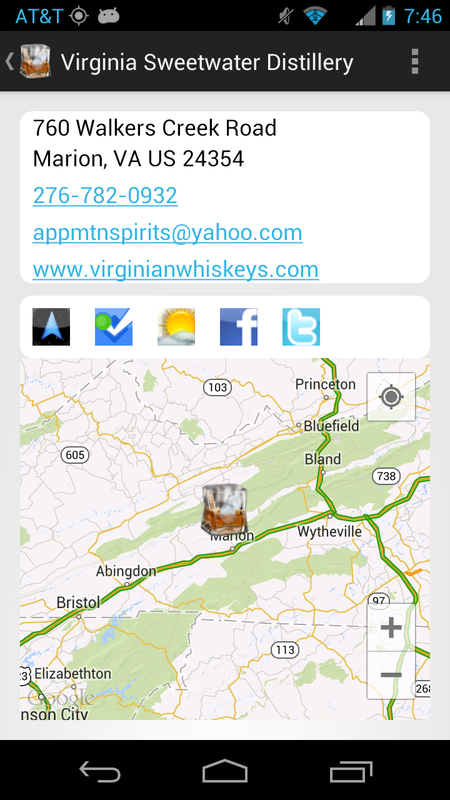 The distillery is located in deep southwestern Virginia between Wytheville and Abingdon. The brand name is in honor of owner's, Scott “Mash” Schumaker, brother LTC William Sean Schumaker. He was the final Commander of the 32nd Signal Corp Battalion and "his troops while under his command would stop at the main gates in Iraq and shout “Sound the War Horns”". The whiskey has a smokey honey aroma that continues in the palette; very peat-like, candied praline flavor - finishing very smooth. Very nice. Pair with The Steel Wheels. Cheers. Bodega del Fin del Mundo Reserva 2011: tobacco aroma, blackberries, earthy minerals, dark chocolate, a slight pepper finish. A little more tannins. Moving on to our third #WineStudio Session XII – Germany’s Lesser Known Varieties from the Rudi Wiest Selections Portfolio session. This week Protocol Wine Studio & Rudi Wiest Selections featured two red wines, the Friedrich Becker Family Pinot Noir 2011 ($20) and Schnaitmann 2011 Lemberger ($20). In Germany, Pinot Noir is known as Spatburgunder and for the past decade one of the top producers - according to Gault & Millau - is the Friedrich Becker Family. As the name implies, this operation is a family affair. Fritz Sr. took over the estate from his father in 1973 and in 2005 Fritz Jr. took over the winemaking responsibilities while his father continues to manage the vineyard. Fritz Jr. is now the 7th generation family winemaker. Almost 70% of their vineyards are located in Alsace, a historical anomaly since the family vineyards have crossed the French-Germany border several times. Since the end of WWII, the Becker’s vineyards are actually straddling these two countries. One of these vineyard sites is Kammerberg (GG), a steep single vineyard near Wissembourg that the family recovered in 1966. The other site is St. Paul (Grand Cru), which was first cultivated in the 14th century by the Cistercian Monks of Wissembourg. 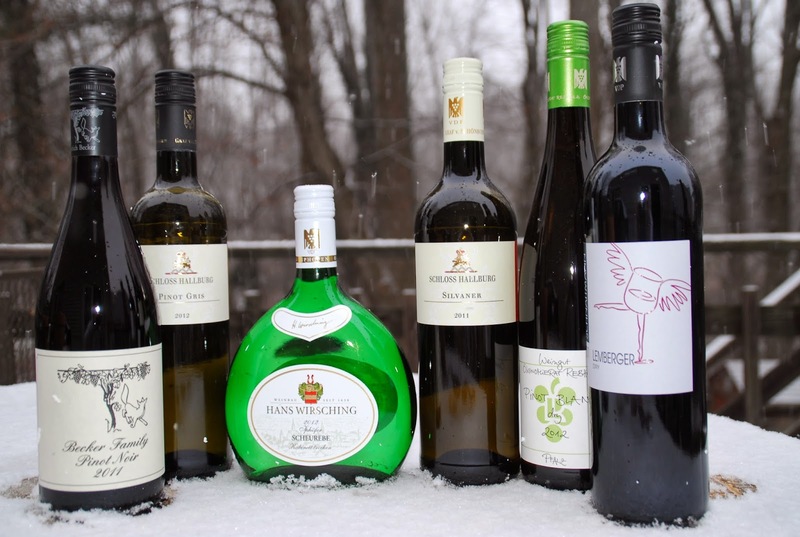 "German growers with holdings between Schweigen-Rechtenbach and Wissembourg are permitted to market the wines produced from their “French” grapes under the German appellation Sonnenberg." (German Wine) And 80% of the Becker Family 2011 Pinot Noir are sourced from the limestone rich Schweigener Sonnenberg region. The wine starts with a dark fruit aroma, then velvety, chewy, cherry flavors on the palette turning to an earthy barnyard; and finishing with very soft tannins. This is a very approachable wine. Schnaitmann Winery also produces a well received Pinot Noir, but for this tasting we focused on their 2011 Lemberger. Rainer Schnaitmann is a relative newcomer to the Germany industry having operated for only 15 years. The vineyard is located in Württemberg where 80% of the grapes planted are red grapes - quite a unique situation in Germany. According to our hosts, "Lemberger is cultivated almost exclusively in Württemberg, where it accounts for more than 14% of the region's vineyard area. Lemberger is a black skinned grape variety. It buds early, ripens late & thrives best in a warm environment to fully mature." In many instances Lemberger wines are very similar to Pinot Noir with more dark fruit flavors and a little more spice on the tail. This completely describes the Schnaitmann 2011 Lemberger. The nose opens with dark fruit and licorice, followed by a creamy blackberry flavor, finishing with a slight spicy character.My favorite characteristic of Lemberger or Blaufränkisch. 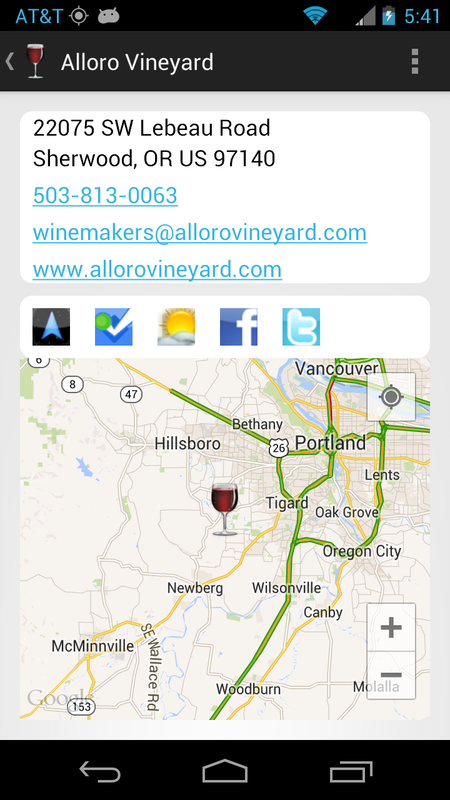 As a corollary to the Pinot in the City activities, I attended a lunch focused on one of the Willamette Valley wineries - Alloro Vineyard located in the Chehalem Mountains AVA. Owner and Vineyard Manager, David Nemarnik along with winemaker Tom Fitzpatrick invited me to join them at the Range Restaurant to learn more about the winery and their portfolio. Nemarnik also gave an overview of the Chehalem Mountains AVA, the largest sub-AVA within the Willamette Valley AVA and the last to be designated. There are three distinct areas within the AVA that differ in soil composition. The northwest faces the ocean and contains sandstone and marine sediment, whereas the southeastern section is derived from volcanic activity. The northeast side contains soil deposited from the prevailing winds created silty, loess soils - hence Laurel Ridge and Alloro Vineyard. The winery is a small operation, we are talking just 2,000 cases annual production which makes their presence in the Washington DC and NYC markets quite surprising. Winemaker Tom Fitzpatrick joined Alloro in 2010 and his UC Davis education and Burgundy training is well suited for Alloro's two primary varieties, Chardonnay and Pinot Noir. In the past Oregon Chardonnay was not respected and Nemarnik described how the original vineyards were planted with a poor choice of clone. Eventually, vineyards planted the Dijon clones 76 & 96 which are more suitable to the Willamette Valley climate. The 2012 Alloro Chardonnay was barrel fermented (20% new oak) and is a fresh wine, with white fruit notes followed by a nice roundness in the palette. Very nice. 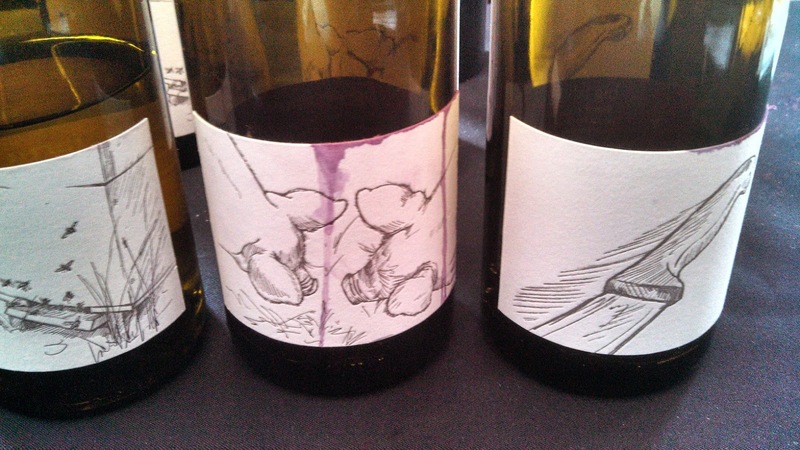 Fitzpatrick applies a minimalistic wine making approach, allowing the wine to represent the vineyard as well as the year. That doesn't mean he's not active. The cellar contains over 80 fermenting or aging barrels and for the Pinot Noir he must determine which wine will be designated for their Alloro or Riservata labels. The Pinot grapes are four Dijon clones and all the juice is fermented in barrel. 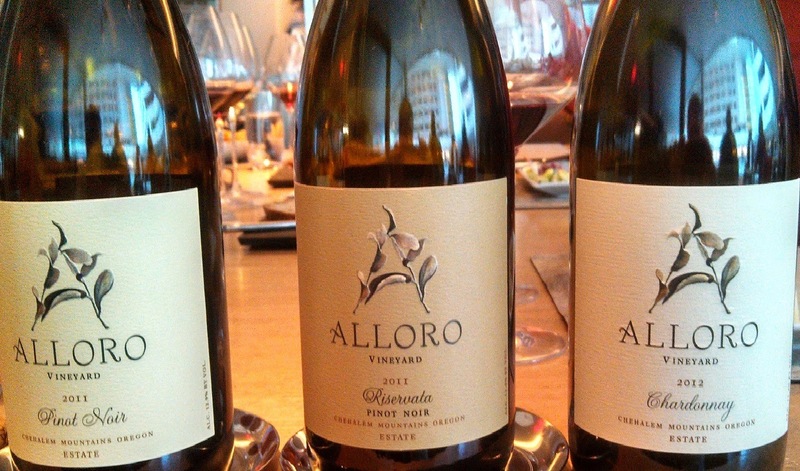 In 2011, 1,400 cases of the Alloro Pinot Noir were created - the winery's largest production. This is a silky smooth wine, dark fruit forward with a creamy mid-palette with very smooth tannins. Very nice. At the same time, 300 cases of their barrel selection reserve - 2011 Alloro Riservata Pinot Noir - were produced. Once again dark fruit dominates with a larger mouthfeel the same creamy texture, but this time an addition of spice and more acidity on the finish. Wow. 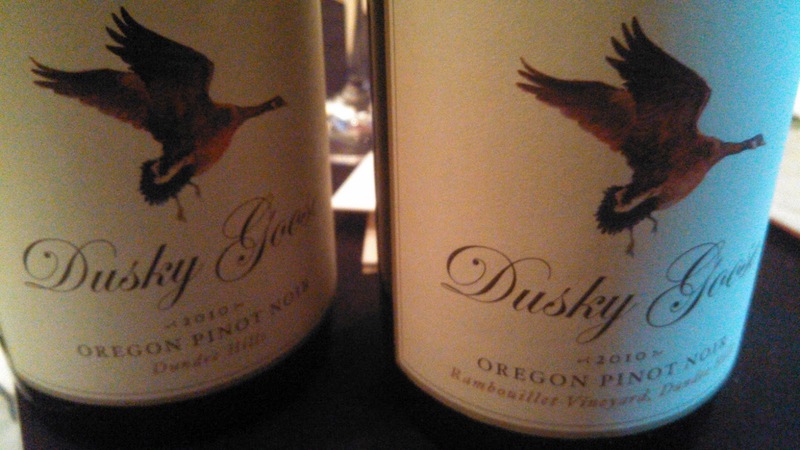 This is why the Willamette Valley is know for Pinot Noir; I need to visit soon. If in Northern Virginia, the Alloro wines as distributed by Kysela Pere et Fils, Ltd and are available in my hometown at the Vienna Vintner. Pair with Portland's Foghorn Stringband. Cheers. Moving on to our second #WineStudio Session XII – Germany’s Lesser Known Varieties from the Rudi Wiest Selections Portfolio session. This week Protocol Wine Studio & Rudi Wiest Selections featured two more white wines, the 2012 Rebohlz Estate Pinot Blanc and the 2012 Graf von Schonbom - Schloss Hallburg Estate Pinot Gris. We started our tasting with the 2012 Rebohlz Estate Pinot Blanc ($20) and honestly it was gone before I blinked. Darn dinner guests. No wonder winemaker Hans-Jörg Rebholz was chosen Winemaker of the Year in 2002 and the estate was awarded Collection of the Year in the Gault-Millau 2013. In fact, the Rebholz name translates to “wood of the vine” and the family has been involved in viticulture since the 16th century, with the current winery belonging to the family for the past 100 years. And according to Protocal Wine Studio, "Rebholz has lately become the prime source for naturally made, terroir-driven, dry wines in Germany". The estate, “South-Pfalz”, contains 70 plus year old vines thriving in limestone soils and farmed bio-dynamically. Pinot Blanc (Weissburgunder in German) is a genetic mutation of Pinot Noir and a late-ripening, thin-skinned, tight-clustered grape. The 2012 Rebohlz starts with white fruit and stoney minerals on the nose with the earthiness continuing on the palette along with a creamy peach-lemon flavor. There is great acidity in the tail - real refreshing. Quite a nice wine. One other note - winemaker's Hans-Jörg's handwriting is the "font" written into the label. 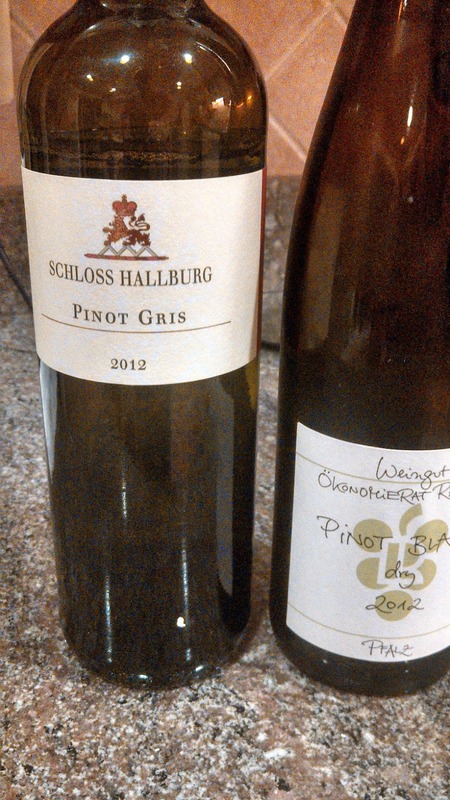 In our previous post we reviewed the 2011 Graf von Schönborn – Schloss Hallburg Silvaner Dry, Estate ($20) and for this week we turned to the same winery's 2012 Graf von Schonbom - Schloss Hallburg Pinot Gris ($20). The estate is farmed organically and is mainly gypsum marl, gravely loess, and clay. The Pint Gris exudes a lemony peach aroma followed by minerality and depth on the palette, and another refreshing acidic finish. I used to think Pinot Gris was too bland; not the Schloss Hallburg. 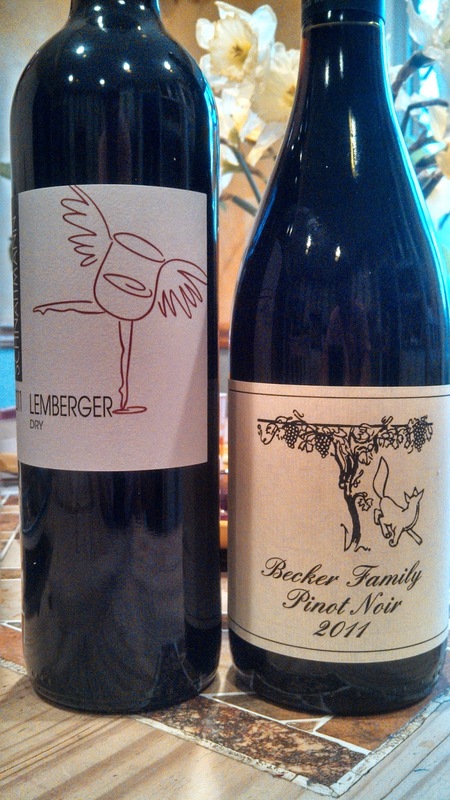 Next up, reds Lemberger and Pinot Noir. Cheers. This past weekend I refused a request to bring home a bottle of Absolut and instead picked up a bottle of Blue Ridge Vodka ($25) from Chesapeake Bay Distillery. The distillery is nine years old and two of the three partners are or were active-duty Navy seals. 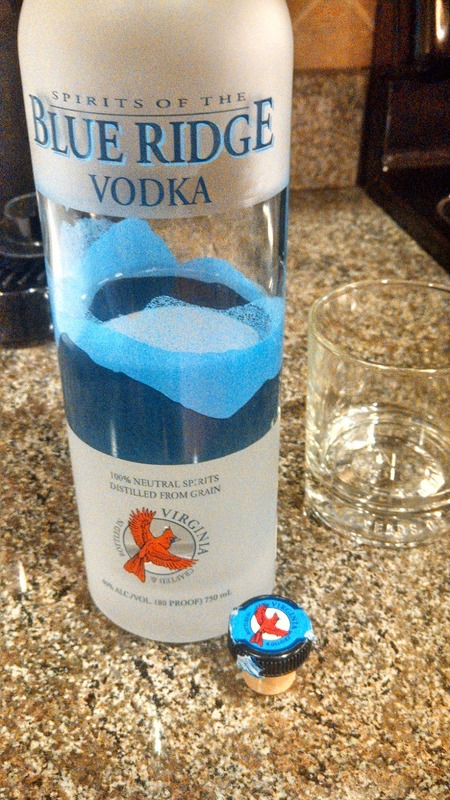 The vodka is distilled from regional corn (thus gluten-free) which are also GMO free. The corn's sweetness shines through the nose as toasted sugar with the flavor as creamed honey cornbread. The vodka finishes with a mild burn - very smooth. Nicely done.